Another year has come and gone with my MMO gaming-and my MMO blogging! And as is traditional for me, it’s time to look back at 2017 and the games I spent my time on-and perhaps take a peek into what is planned for the future. I’d closed out ’16 with the beginnings of putting my characters through the Knights of the Eternal Throne expansion for Star Wars: The Old Republic, and 2017 continued that work. I was aided a great deal in the fact that most of the publishes last year focused on class balance, raids, and the other sorts of stuff that I tend to have little interest in. We did get a couple new strongholds, but I haven’t gone out of my way to get access to them-I’m still way under-decorated with a couple I have now! Thanks to the lack of newer story content, though, I did manage to get all eight of my “class representatives” to finish the KotET expansion-and a couple have gone beyond that. There was a short bit of entertaining activity with the United Forces update, which consolidated the servers dramatically, and included a bit of “encouraged grouping” in order to get the companion who didn’t win the Dark vs Light event in ’16. I’d always suspected Darth Hexid would show up sooner or later. What’s next for SWTOR for me this coming year? Well, since I wrapped up the last of my original eight through the expansion, I think it’s time for me to bring the stories of the Jedi Anthrandos and the Inquisitor Sorshan to a conclusion-both of these characters were chronicled heavily in 2016, but left hanging since I wanted to get my other characters through the then-new expansion. I’ve caught up, so expect somewhere between two to four posts featuring the conclusion of their saga. I don’t plan to put either of those characters through the post-expansion content, as it’s already hard enough for me to push through the eight. Speaking of those eight, I will probably also put them through the post-expansion content to get them all caught up; who knows what lies ahead for the game in 2018, after all? There is no content but what we make for ourselves-okay, that’s a minor exaggeration. Star Trek Online actually got a decent chunk of my time in 2017. I chronicled the adventures of two major characters through the year. The first month concluded the adventure of temporal agent Rick Masters, Agent of Yesterday. Then, starting in September, I began to chronicle the Orion pirate-at-heart Dathiro, giving a look at the Klingon side of life, as well as exploring the usefulness of the Foundry missions out there. In between all that, we got a couple of new missions. Those missions featured the Lukari, encountered during the Future Proof series, and expanded upon their story-which also brought in the Tzenkethi on their mysterious sterilization crusade. We reunited the Lukari with their cousins, so to speak, and discovered that the Tzenkethi might have a point with their campaign. We got a new fleet holding-well, I sort of threw in the towel with that one. Fleet holdings are a game for the larger fleets, and I’m not involved with any larger fleets to mess with it. We also got a couple of missions more or less independent of that storyline-like recapturing Sela (AGAIN!) after some fallout from the Temporal Ambassador mission way back, and a return to the Nexus (of Star Trek: Generations fame) with the coming of a being who I’m not convinced we’ve seen the last of. Oh-and we also get the return of a Klingon warrior long thought dead, which could make the political situation on Qo’noS very, very interesting indeed. Unlike last year, Champions Online got a lot of love from me. I’d noted that I hadn’t put any real time into that game in ’16, and I resolved to run a character through that game up to max level, and I chose to do it with the character Willforge. Chronicling his adventure through the various content in the game was a blast, and while nothing really new came out for a solo sort of guy, it had been a long enough time since I did anything at all in the game that stuff felt at least a little fresh. And best of all, since it isn’t as linear as STO or SWTOR (which isn’t to say it’s perfect, but it’s still a heap better), I was able to pick and choose a bit as to how I leveled the character. The game did get some new content in, but it seemed to tend to the group oriented, and because I keep floating from game to game, it’s not really that simple for me to get that involved with them. I do expect at some point in 2018 to return to CO and run a new character-I have a couple of concepts I’ve been kicking around-but with Dathiro’s story rolling in STO, along with its expected content, finishing Sorshan and Anthrandos in SWTOR, and whatever rolls up in that game, well…we’ll see what happens..
Didn’t see a lot of activity, but…. EVE Online, despite its transition to a freemium model, didn’t get all that much time from me. I did get my character up to the point where he could fly a cruiser, but he’s still training up skills to actually survive flying one; and of course, gaining income enough to afford to fly one. And that was before the big update that opened up battlecruisers and battleships to the character. I’ve recently done some minor dabbling in it again, mostly consisting of resuming training skills, flying the occasional set of level 1 missions (and just recently upgraded to level 2s! ), and messing with ammunition blueprints to reduce dependency on outside arms dealers. Currently, I’m flying a destroyer, which is handy to deal with frigate sized opposition. If I get to the point of purchasing and flying a cruiser, I may well start in on those level 2 missions. No hurry, though-it’s not like I don’t have enough going on elsewhere, right? That wraps up my look back on 2017! Thirteen years, right? Who would’ve thought I’d have been doing this that long? I don’t have any great plans to continue writing up fiction for my assorted games-although one never knows; maybe I’ll do a serialized sort of thing on WordPress and link to it. I also keep kicking around reviving the “Images of the Ranger” site, since I still have heaps of screenshots and heaps of related images (and that site still has heaps of upload space); I’d been considering doing a series there on player housing, and I think it might work better on that site than on this primary site. So stay tuned-anything can happen. Hopefully I can make 2018’s gaming as enjoyable as 2017’s! Just a smallish post today-getting ready for the holiday season tends to eat into the gaming time. Still, I’ve managed to put a bit of time in anyway. Dathiro in Star Trek Online is proceeding quite nicely; I’ve gotten him to where I’m almost ready to do the next big post with him, although-again-time has more or less guaranteed that it won’t go up before the New Year. I’ve done a couple of Foundry missions and have a third lined up, but I’ve also been doing a bit of the Winter Event to see if I can manage to get enough of the vouchers this year to get the Winter ship. It seems doable, even with the time I’ll be away from the keyboard, but we’ll see how things finally shake out. I’ll have some thoughts on leveling and the specific Foundry missions I’ve been doing next time (unless something big happens in the MMO-sphere that gets my attention). It’s probably also worth noting that I’ve started doing short log-ins with my EVE character, mostly to start training up some skills so he can start looking at cruisers and higher; since the big patch came down with the changes in character limits, I’ve thought about putting a bit more time into EVE, but for now, it’s just limited to “swap skill training”. So that’s where things are at the moment-aside from me wishing everyone a Merry Christmas, Happy Hanukkah (I know, I’m practically closing the barn door here), or the holiday of your choice! See you in ’18! Soon, free players can fly one of these…no matter what faction he belongs to. It’s been a while since I’ve put up anything involving EVE Online. It’s probably not shocking that I had spent about a month doing stuff, and then kind of went away after the Alpha Clones got released last year. I’d gotten my free guy to the point where he could fly destroyers and do a reliable job on cleaning up level 1 missions, and use an ammo blueprint so that ammunition shouldn’t be an issue, but as I knew I’d not be spending a lot of time in EVE-really, I bounce between three other games as it is-I ended up quietly putting the character to the wayside. I was going to be running into issues anyway, as Alphas have a limited number of skill points (although I was nowhere near the limit) and could only use a limited amount of equipment, which included ships. But last month, CCP devs dropped this bit of data on everyone: in December, Alphas are going to get some expansions. For starters, and probably most significantly, Alpha players will no longer be limited to a Cruiser sized ship as their top tier; Battlecruisers and Battleships are being opened up. That’s a big deal, because it means that level 3 missions will be much easier for players, and level 4 missions will actually be possible (well, solo, at least; I’m sure the smaller ships in a group might be okay). That’s a big step up in available income. You also will be freed from your initial faction’s ship type-if you’re a Gallente Alpha, you couldn’t fly anything other than Gallente ships. But now, it seems that the floodgates are open, and you can train up and fly the ships of the other three. And for the truly daring, it also allows use of pirate faction ships, so if you’re desperate to join a pirate factions like the Serpentis and fly their stuff, your time is coming. Another bit of news that makes Alphas more of a force upcoming is the ability to use some Tech 2 weapons, at least for medium or small weapons. That’ll keep the smaller class of ships a bit more attractive-not that the battleships are all that bad with just Tech 1 weapons. This apparently also includes the ammunition for those weapons. 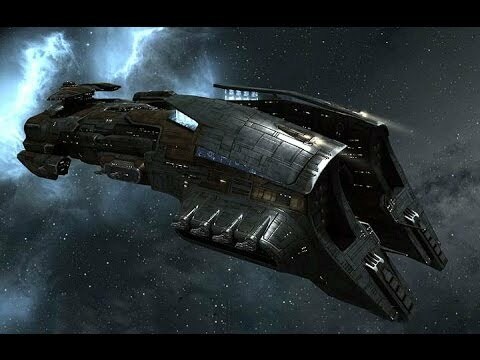 It’s good for the small ships, but since the large ships aren’t getting the Tech 2’s, I wonder if more Alphas will gravitate to the Battlecruisers instead. No idea how that might influence group play; my experiences in group play were pretty limited way back in the day when my old guildmates were with me prior to the release of Star Trek Online, and we mostly did mining or mission operations-and there weren’t really enough of us to match the kind of stuff you read about on the various MMO sites involving EVE fleet battles. The skill caps are getting fiddled with too, but there is still a semi-hard cap of five million skill points, but you can apparently get beyond that from subscription time or skill injector items-I’m not sure where those stand on market value, or if they’re being sold for PLEX, the RMT currency. That said, I can again say that my own Alpha is a long, long way from 5 million skill points, but then, he hasn’t started training those battlecruisers/battleships yet. He might never-after all, “never fly what you can’t afford to lose”, and that destroyer is pretty much presently at the upper end of that for the character. But then again, I’ve been limited to level 1 missions, and only recently logged in to start training up cruisers; the income does go up with level 2 missions and beyond. The changes are coming in December, but I haven’t seen a specific date in the month. I’m not sure how this will change the dynamics of the player base-or if it’ll encourage more people to join in. But it’ll be interesting to watch, and who knows? I might see about getting my Alpha a bit more time to mess around. It’s that time again! It’s been another year of MMO gaming, MMO blogging, and now it’s time for me to look back at 2016 and throw out some thoughts on the past as I look to the future! Specifically, let’s see what’s been going on with the games I play. 2016 was a pretty good one for Star Wars: The Old Republic-at least from my point of view. Updates came regularly with new content, tied to the ongoing story of Knights of the Fallen Empire, and concluded the year with the conclusion as Knights of the Eternal Throne. The story feels like it effectively concludes the stories of the assorted classes into one funneled end (maybe two-I still haven’t thrown a dark-sider through KotET, and things may be different there), which does lead one to wonder if we’re at the end of story content. Certainly we are for most of 2017, as the developers are rededicating themselves to group content; just how that unfolds is something we’ll be learning early this year. I’m a tad annoyed at the fact that a significant number of companions for the classes remain unaccounted for, and that aforementioned rededication makes it unlikely we’ll see any make a comeback in 2017; yes, they can be brought back in a game mechanics sense, but they’re still effectively gone in-story. All that said: the companions have mostly been irrelevant in-story at the end of the class stories (with perhaps a sop thrown in depending on your class in the Shadow of Revan expansion), so one has to wonder if it’s really a big deal at this point. Something to think about. From a personal point of view, this year saw the return of my tracking assorted characters through content. Thanks primarily to the Dark vs Light event that kicked off in the summer, I began the journeys of Anthrandos the Jedi Knight and Sorshan the Sith Inquisitor, and brought them from humble beginnings on Tython and Korriban and through the KotFE expansion. Neither have as yet gone through KotET, but they will-so expect at some point “final” posts for those characters that will encompass that expansion, once I’ve finished getting my primary class characters through. Naturally, those primary characters have gone through the entirety of the KotFE expansion, one of which maxed out his alliance contact reps, one of which got them all to at least level 10. My smuggler and agent win the prize for most total companions now, as they both have all the Star Fortress companions, and almost all of the companions available in alerts, excepting ones who were refused on moral grounds (or killed off) and the PvP related ones. Sure seems quiet in the galaxy these days. Coming in at a distant second in my time is Star Trek Online. Last time I did one of these posts, we were just beginning the New Dawn, heralding the rebirth of exploration in the galaxy. Guess that was mostly hyperbole, because what we actually got was the latest outbreak of the Temporal Cold War introduced in Star Trek: Enterprise. Things started really rolling, though, with the year’s free expansion, Agents of Yesterday, which created a new sub-faction: the 23rd century Starfleet. This was tied in hard with the Temporal Cold War as well, but man, it was fun seeing missions and characters in the 23rd century look. The New Dawn arc concluded and a new one is underway now, which returns a station from the past returning to the limelight. At roughly the same time as developing the idea of characters in the Dark vs Light thing in SWTOR, I decided to chronicle the adventure of a character starting out from the 23rd century with Rick Masters, and while my time has been more limited than usual in STO, the character has finished his run through “New Dawn” (or “Future Proof” if you want to use the episodic arc name), and has caught up to the present time in the game. Since the new arc seems like it’ll at least somewhat involve the space station the character saw go away back in the 23rd century, Masters will likely see at least some participation there, but I’m likely to look to focus on my Starfleet, KDF, and Romulan mains a bit. That said, since the 23rd century guy is in his own sub-faction, I can easily justify promoting him to a “main” status. Does anyone else out there have multiple main characters, or is it just me? It’s hard being an altoholic. Still not getting a lot of love from me. I blame Father Time. Champions Online, still technically in the stable of games, didn’t get a lot of joy from me this year. I did finally manage to level up a character-Overload, my Reawakened Automaton-to max level, so that opened up a new character slot for me to work with. Unlike previous years, this year saw a bit of content introduced, as well as some significant reworking of the “endgame” experience as far as gear grinding goes (which, apparently, is another way of saying “more grind”). I’ve never been about the endgame, though, and the new content is highly group oriented-which is good, honestly, but for a guy who is as irregular as I am on the game, well, not the biggest attraction. Here’s the other hand: with things wrapping up with characters in SWTOR with the KotET expansion, and its focus on grouped content, it opens up some time for me to do a leveling experience in CO as I have with Anthrandos/Sorshan/Rick Masters. It may be a little less structured, since CO is less structured, storywise, but that could work for the best in many ways. I’ve already been laying the groundwork in my head on how that’ll work, so stay tuned. Returning for a new engagement…. On the fictional front, I’ve restricted myself to reposting some open-RP posts rescued from the fall of GuildPortal last year, including “Injustice” from the Justiciars site, “Birth of the Union” and “The Darkening” from the Union Supreme site. I’m planning to do a repost of “Invasion of the Gems” from the Hyperion Force site at some point in the coming year. As far as new works, though, nothing really came to mind. I am in the middle of writing what I anticipate will be my last MMO-related story, and hope to have something put up this coming year on the Outlaws’ site. Fact is, my motivation on writing this stuff has been fading considerably, and in combination with finding time to actually do the writing, that just spelled a “time to put a bow on it” in my mind. Of course, putting that bow on it will depend a lot on me actually finishing the one I’ve started; we’ll see how that goes. That’s 2016 in a nutshell! The latter half of the year helped reinvigorate some of my blogging, thanks to the decision to start chronicling the actions of my characters again as I had in the old days, and helped fill the empty spaces between game publishes. It puts me in a positive frame of mind as we move forward in 2017 to start year thirteen of my MMO adventure! Last month, EVE Online went free to play. Well, honestly, it’s more like it went into a Freemium model-on the one hand, you have the Omega Clones, which are basically the folks who have been playing EVE prior to the change-some with subscription fees, some with the use of PLEX pilot licenses, which are basically 1 month subs that can be purchased as an in-game item and sold on the market for usually heaps of ISK, the in-game currency. The other hand holds the Alpha Clones, who have a number of substantial limitations on them-but the counterbalance is that they don’t have to pay a dime. In many ways, not so different than Star Wars: The Old Republic. But of course, EVE is a much different game than SWTOR. Folks unfamiliar with the game might be surprised to learn that your avatar isn’t so much the body you craft when you create the character, but rather, the ship that character flies. There is only one server (unless you’re in China, where you have a separate one), which means your character will never escape the reputation he builds-probably. And despite the fact that all star systems have a security rating that impacts the ability to get away with murder, other players can and will blow your ship up if they can get away with it. In a very real way, EVE is about knowing who to trust. And about following the old maxim there, “Never fly what you can’t afford to lose”. Which really should be rewritten to say “Never fly what you can’t afford to easily replace”. Despite this, the game’s been popular enough to last for longer than I’ve been playing MMOs. And with the new Alpha Clone release, I decided to reopen an old account I’d quietly created during a fit of insanity when the devs at CCP had a two for one account sale sort of thing. I killed the existing characters there-I hadn’t really done much with them, and they didn’t even have enough ISK to bother preserving-and made a brand spanking new one. While I could’ve gone back to my primary account, I didn’t really want to revisit the old characters as they would be shells of what they could fly, due to the Alpha restrictions. I chose to mess with a new faction. The characters on my old account had been Gallente, and I felt that I’d done that to death during my previous sting in New Eden, the setting of the game. Instead, I decided to go with the Minmatar. The reputation of this faction is basically “ships put together with duct tape and scrap metal”, and my sense of humor demanded that I go that route. So, let’s talk about restrictions. Firstly, an Alpha is limited to-with two notable exceptions-ships of their own faction. So my character is limited to flying Minmatar ships; he can’t even train the skills to learn to fly a Gallente ship, or a pirate faction ship. The exceptions are the ORE Venture (which is a frigate-level dedicated mining ship) and the Gnosis battlecruiser, which was apparently given out to all active players at the 10th anniversary of the game; I’m not entirely sure if it was one to an account, or one to each character on the account, but based on what I’d seen during my previous run, I’m guessing the former. As you may guess from this comment, I wasn’t active at the anniversary, so no Gnosis for me. That said, I’d probably never fly it; one-of-a-kind in a game like EVE is just asking for heartbreak. Speaking of training skills, many skills are either limited to how far you can train, or to being trainable at all. At this time, the highest class of ship that can be trained for is the cruisers, which is basically two steps up from the frigates. (Destroyers are the tier between.) No battlecruisers, battleships, or capital ships for Alphas. Alphas may also fly the lowest class of industrial ship, so they can at least haul modest amount (like say, a couple frigates) from one system to another. The higher tiers of mining vessel are not available-and that’s to the relief of a lot of pilots, who already have issues with bot-controlled mining fleets. The skill limits also include the upper reaches of specialization skills, so Alphas are not likely to be the biggest crafters, nor the best explorers, nor the best trade lords. All of that said, it is possible to live in the margins. You may not be the best explorer, but you can still explore sites and find modest riches there. You may not be the best miner, but you can still get at asteroids and refine out minerals to use or sell. You may not rule a mercantile empire, but you can still trade on the margins and make a modest profit. And while you may not fly the ships that dwarf cities, you can still make a difference in a fight-either in corporations and alliances in their wars, or simply running missions for Agents in stations. In simpler terms, an Alpha Clone state allows you to experience the breadth of EVE, but not necessarily the depth. You have the capability of doing a lot of things, but not become a master of any of those things. The other little limitation is training time. Skills are not learned by doing, as it was in the pre-NGE days of Star Wars Galaxies, nor are they granted by leveling experience points. Rather, they are learned by time. You start out with a fairly good amount of skills-enough to allow you to do the basics and not embarrass yourself first thing out-and you either improve skills by training a new level of skill, in which there are five per skill, although the Alpha limits may reduce just how far you can train, even as far as only the first level of that skill; or you gain new skills by purchasing/acquiring a skill book which can allow you to start training that skill. Again, Alpha limits apply-many skills just aren’t going to be allowable. The big limit is the actual time taken. While Omega Clones can train “twice as fast”, the reality is that the Omegas aren’t training any faster or slower than they’d been-it’s the Alphas who are training at half-speed. (Use of the Neocom app on my phone helped confirm this.) That’d probably be a bigger deal if Alphas could train more skills that require months to get to. There’s also a hint that the training queue has changed, too. Back in the day, you could only put skills in the training queue that started within 24 hours, but stuff I’ve seen seems to imply that this limit has been altered for Omegas; I haven’t read up carefully on that, so I’m not sure where things stand there, but for Alphas, it’s pretty much as I remembered, so it didn’t bother me. That’s the big picture. Now I’m focusing in on the smaller one. I haven’t had the time to do whole heaps in EVE-the Knights of the Eternal Throne in SWTOR has occupied me a bit, and I still need to get to finishing the Delta Rising arc in Star Trek Online. But I’ve managed to find some time to run the introductory Agent missions for industry, military, mining, production, and exploration. Those missions are well worth doing, simply for the money and the free equipment-including a number of frigates and a couple of industrials-and a destroyer at the tail end of the advanced military. I’ve managed to fit out a Thrasher destroyer, although I’m still working on a build for it-it’s not an ideal fit-and managed to scrape enough together to pick up a mobile tractor unit, which makes salvaging the ships I blow up in missions a lot easier. Travel time’s a pain-although it’s mitigated a lot by use of micro-warp drives, which apparently can now be used in mission areas; back in the day, I had to fall back on afterburners. Afterburners still have a place in EVE, since the MWDs tend to increase your targeting signature dramatically-and if you’re a small ship that expects to survive based on size and speed, you do NOT want to be easier to target! Cruisers are a way off for me-I think I’ll want to get my standings high enough to start doing the level 2 missions first, which will hopefully allow a bit more earnings. That is, if my ship can handle the abuse. The level 4 missions are out of reach for Alphas, I think-those require use of battleships or really, REALLY well-fit cruisers or battlecruisers. But I’m hopeful that I can at least get to the point where farming level 2’s are feasible. The best part of being an Alpha is that you don’t need billions to do what you want to do. If you’re happy flying smaller ships, it’s not hard to earn enough to make sure you can afford to lose those ships on a regular basis. And, after all, that’s the name of the game. This looks like a nice place. Shame I’m gonna blow it up. Preparing for the most implacable enemy New Eden has ever seen: free players. While I’ve been spending my time heavily in Star Trek Online and Star Wars: The Old Republic, I’ve not been ignoring the news that tends to float around on the Internet concerning other games, particularly if it’s a game that I’ve played in the past. For the most part, I don’t make remarks on them, mainly because…well, they’re games I’ve played in the past. The key word being “past”. Thus, even though World of Warcraft’s got this expansion out again, I’m not compelled to remark hard on it-aside from the odd offers of free game time, I don’t really expect to spend a lot of time on Azeroth anymore. The same also held true for EVE Online; I’d had a number of stints there, including a lengthy one before STO was released with some of my old SWG guildies. But aside from the occasional “play five days free again”, I’d not really spent a lot of time with it. But recently, the developers as CCP dropped a bomb on the market: even though they’ve tiptoed around it, EVE Online is slated to go to a freemium model in November. Now, in the interests of fairness: there’s really two types of freemium games. Ones that are literally free to play and sell a bunch of stuff to make playing easier (like STO), and those that are technically free but have so many restrictions that if you really wanted to enjoy the experience, you’ll want to subscribe on a monthly basis (like SWTOR). From the sounds of it, this is going to be closer to the SWTOR model than it is to the STO model. It’s still not quite the same, though. The Alphas are the new guys-or the guys who have let their subs lapse (ahem). The Alphas can only use certain skills, at a certain maximum level; use only certain ships-Tech One frigates, cruisers, and destroyers-and have a ceiling on their maximum skill points (which is still a pretty healthy number but hardly earth-shaking). While it hasn’t been said, I would not be surprised if, in addition to those ships mentioned above, one might also get access to the industrial ships for hauling, as those are mostly harmless (please, nobody send me builds of heavily armed Iterons); I do not expect the Tech One mining ships to be on the list, though, given the troubles the game has had with mining bots as it is. Why would CCP make life even easier on those? I can see them justify hauling, but not mining. That said, a legion of mining frigates can probably do a bot’s job just as well over time. Presumably, a returning player-one who is returning free, that is-will find all his clones in an Alpha state, and I can easily see a situation where a player might reserve one of his three character slots for an “Alpha only” character to use in free periods, and leave another as their “paid Omega guy”. Certainly, that’s my plan; keep my original pair in Omega-land and leave them semi-retired, and spend time with a new character. This should not imply that I’m expecting to upgrade to full-time status with EVE again; but I’d be lying if I didn’t admit that I expect to log into it come November and see what’s what. Of course, this also begs the question of just what I’d actually do when the time comes. After all, I’ve done my best to eschew PvP wherever it lies, and PvP lies at the dark heart of EVE Online. Mining is out, hauling is out (until proven otherwise, I’m going to assume it won’t be there at launch, no matter what I figure may happen in the future), and mass market manipulation is out. Crafting is a possibility, as is exploration to a limited extent seems possible, since those skills are available but have a limited ceiling on training. The classic PvE missions are still there (well, presumably-it’s been a while), but with the limit on the ship types, one can easily presume that you’ll hit a ceiling on the types of missions you can run with a reasonable chance of success. Still, one has to admit: even with the limits, there’s a pretty fair amount of stuff to do. EVE is still one of the most pure sandbox MMO’s out there, and with its huge galaxy of star systems (and even bigger if you dare low-sec or null-sec space), it’s difficult to not find something worth doing. Even if it just involves day trading at Jita. Odds are high that I’ll be making a new character for the freemium EVE ahead, and unlike my previous ones, it won’t be Gallente; I sort of want to see other sides of the EVE universe, and I may very well just look at the galaxy map, see who’s farthest away, and go with that faction. I’m like that sometimes. I had to pause when I typed that title in. One decade of semi-regularly posting my thoughts on MMORPGs, from my early “gee-wow” phase of starting playing the games to my significantly more jaded self today. And the blog’s covered the bases. Some posts have been simple peeks at “here’s what I’m doing this week” (back when I was a lot more regular). Some posts have been about deeper thoughts on MMORPGs in general, and some in specific. Some have praised assorted developers, and some have…well, let’s go with the opposite of “praised”. There have been bumps in the road, of course. A few times I’ve pondered just saying “Game Over” to the MMO scene, usually during times of big transition, but something always managed to keep me at least poking my nose in. And of course, RL has occasionally gotten in the way of playing, much less putting up posts about things. At one point, I even bit the bullet and made the big jump from the GuildPortal blogging host to WordPress. I’ve played quite a few games over the years. Star Wars Galaxies was the gateway drug, and when I started playing that I honestly felt I’d not need to play any other MMOs. If the New Game Enhancements had any positive impact on me, it was that it kicked me out of the comfort zone and allowed me to look at other MMOs. And the list goes on: from games where I only dabbled such as Lord of the Rings Online, EVE Online, and DC Universe Online; to the games where I truly spent a significant amount of time with, such as World of Warcraft (hasn’t everybody? ), Star Trek Online, Champions Online, Star Wars: The Old Republic, and of course, the one that took the top place in amount of time spent, City of Heroes. Well, we’ve had a lot going on this year, so let’s set the wayback machine and take it for a spin. In Star Wars: The Old Republic, I finally managed to complete my long-term goal of getting through the class stories for all eight classes. I wrapped up my Bounty Hunter relatively early in the year. My Jedi Counselor took a bit more time, thanks to the appearance of the Galactic Strongholds expansion, which brought player housing of a sort to the game. Unfortunately, what they didn’t tell you was that in order to open up all those nice rooms, you’d have to shell out Cartel Coins (the real money equivalent) or lots and lots of credits. I did eventually blow some of my accumulated coins to open up my Nar Shadda rooms (I got a fair amount of them for free, being a subscriber), and a whole lot of credits. With all the rooms opened, I took a short break in order to recuperate from the grind burnout, before pushing onward with my Counselor and completing the last class story. But of course, that turned out not to be the end of the story, because the Shadow of Revan expansion hit before year’s end, and as I understand it, there are mini-class stories in that. Unfortunately, Bioware/EA decided to make it a paid expansion, which put me in mind of what happened with the Rise of the Hutt Cartel expansion-namely, the fact that it became free for subscribers less than six months after it was released. I’m all for eventually releasing expansions for free, but the turnaround for that seemed like dirty pool to me-and so I’ve decided not to fall into that trap again, and will wait until the inevitable happens with Shadow of Revan. Guildwise, not much goes on there. I had originally hoped that I might be able to pull off a purchase of a fleet flagship there, but the price for the ship is so disgustingly high-and given that I’m more or less solo in that game these days-and the benefits are iffy in that case anyway, that I figured that it’s something we could live without. A guild stronghold was established on Coruscant, but I don’t anticipate opening any rooms there for a long time; I have enough work to do opening up my own Coruscant and Dromund Kaas rooms as it is. I’m reminded of being shaken down by a bully…. Star Trek Online has long been a source of…well, let’s call it discontent. For me, at least. I’m good with their story content, but their business practices continue to make me sick. (Okay, that’s a bit too extreme-let’s say “extremely unhappy”.) The first blow was the removal of the Exploration clusters, removing what could well be considered one of the primary pillars of Star Trek in general. Then came the new tier-6 ships, rendering the tier-5 ships-virtually all of which were paid for with Zen, the real money equivalent for Perfect World games-obsolete. Or, if you wanted to be really insulting, you could upgrade some of those tier-5 ships to be almost-but-not-quite as good as tier-6 ships for more Zen. In fact, it seems that it’s now about fleecing customers; the crafting system is designed to take forever to max out in any branch, unless you spend a large chunk of dilithium-and given you can only refine 8000 dilithium per day, you’re looking at being forced to purchase dilithium off the exchange, which requires-you guessed it-Zen. The announcement that bridge officer training is about to go down the same track is one that continues to bring me closer to abandoning the game entirely; as it is, I spend less and less time in the game. Which is a pity, because the devs can do some good things. The story advanced to bring an uneasy peace between the Klingons and the Federation at last, thanks to a bigger threat uniting them in the form of the Iconians. This included a revamp of Earth Spacedock (again), which is an extremely beautiful bit of work. Also of interest was the release of Delta Rising, the new expansion taking place in the Delta Quadrant; while what story is there is pretty good, it’s also somewhat lacking in comparison with the Legacy of Romulus expansion. Comparing the two isn’t a real comparison: Legacy beat the tar out of Delta in terms of sheer content. Accordingly, while I enjoyed the Delta stories, it didn’t enthuse me as much as the Legacy expansion-and I’m not that big a fan of Romulans. The Corps of Discovery fleet still continues to exist, although the active folks tend to be on when I’m not on (and there aren’t many of them as it is). One of the members managed to get the fleet embassy up to tier-1 through sheer determination and will (not to mention dilithium and fleet marks), so the fleet’s now got a tier-1 embassy to go along with its tier-2 starbase. I’ve entertained the thought of pushing a tier-1 dilithium mine, but at this stage, I think everyone’s burned enough out on that particular grind. Despite my exit from Champions Online last year, I went back again. I guess I needed to get my superhero on, and it beat DC Universe Online in my book, so there it is. (I do play Marvel Heroes as well, but honestly, they don’t let me make my own creations. That’s painful for a creative sort.) I spent some time getting a number of my stable of characters to the max level 40, and began a few new characters-one of whom also made it to level 40. One of those characters came about because of something truly unusual for CO: new content. While lockboxes have been the primary push in patches in the game, some actual new missions were put in-and for a change, they weren’t limited time deals, but permanent additions to the game, featuring the crazed robot, Mechanon. All things considered, I’d call that a successful bit of work for the devs there, given that the game continues to be barely above maintenance mode. On the other hand, given the activities in STO, I’ve decided that this isn’t a bad thing for CO. That means that there’s less chance of the game being poisoned by the devs to the point where this one makes me ill as well. I spent some time playing EVE Online again this last year; I didn’t do a whole lot, but I did manage to get a couple of personal goals complete. First, I managed to get my character standings high enough to install jump clones at a Sisters of Eve station, and second, I managed to finally delve a short bit into wormhole space-and nullsec space, which ended rather predictably. (But I didn’t get pod-killed!) Juggling a fourth game is asking a bit much, though, so I let the account go dormant again-but I’m reasonably sure that at some point, I’ll have the urge to go back; after all, I’ve still got my eye on one of the exploration ships that the Sisters sell…. My MMO fictional work was limited this year, for a couple of reasons. The first is that in this year, I’ve not been really attached to any guilds that could be called active; I did make a short attempt to join an RP fleet in STO, but it didn’t really work out-mostly because I just didn’t feel it worked for me there. So I’ve been doing the solo thing mostly, which has allowed me to spend relatively equal time in the assorted games, but it does tend to get boring without people. We’ll see how things go next year. The other reason is that the one story I did do, “Unending”, was another one of my overly-long works, which closed out my City of Heroes stories with a ribbon to tie up my remaining loose ends. Where I go from here is still up in the air. The year’s been a somewhat rough one, all told. While the games I played continue to have their positive points, actions taken by their assorted developers have managed to put a big spike in the enthusiasm. It could be that I’ve become jaded by my ten years now and have become more cynical in attitude towards the developers. Or maybe it’s just short-term burnout. But there’s still a couple of games on the horizon that could displace any one of my current games-so it’s a wait and see situation. Until then, we’ll see what Year Eleven will hold. Recently, I felt it was time to do something in EVE Online that I’d been looking to do for a while now. It was time to go wormhole diving! This required a bit of prep first, though. Wormholes are considered null-sec space, in a manner of speaking. That manner of speaking would be “if it can see you, it can shoot you and laugh as the bits of your ship, your pod, and your corpse drift away in the cold unforgiving void”. Obviously, this was not a situation where I wanted to take an expensive ship loaded with expensive tech. No, this was something that called for “expendable”. One of the truisms of EVE that you see quoted everywhere is “don’t fly anything you aren’t prepared to lose”. So I made sure that I could afford to lose this one: a simple Imicus frigate, with tech one cloaking devices, afterburners (found out I accidentally never trained microwarp drives on this guy-oops), and scan probe launchers. An afterthought had me slap in a relic and data hacking module; just in case I found something interesting. My skills for scanning (meaning, the character skills, not necessarily the player’s skills) are pretty good, so I wasn’t concerned about probe strength or anything like that. I figured I had decent odds of finding a wormhole somewhere. And then I expected to go in them. My plan was to go as far into wormhole space as I could, or failing that, into space far, far, far away from home. Wormholes can lead anywhere, after all-and a new wormhole in wormhole space could land me in the wilds of null-sec just as easily as hi-sec. I was set-I had already taken the additional precaution of using one of my expendable jump-clones, without any implants. So I had an expendable clone body flying an expendable ship equipped with expendable tech. The cash it set me back could be made up in one, maybe two easy level 3 combat missions. I didn’t bother insuring it; my expectation was that it was space-dust the moment I undocked, and if I got back with it intact, I’d call it a bonus. It didn’t take me long to scan down a wormhole somewhere, and go right on in. The interesting part about wormhole space is that it has no “Local” chat tab-or more precisely, that tab doesn’t tell you how many people are in that portion of space. So if nobody sees my arrival, nobody knows I’m there. Being the paranoid sort, though, I made sure to warp away from the wormhole and find a nice quiet spot to scan while under cloak. Found another wormhole, it led to another wormhole system. Found lots of other things on scan, too, but since this was effectively a probe/exploration ship, not a combat ship, it would be a really dumb thing for me to try to get to those site in wormhole space and deal with the NPC Sleeper ships which I’m told are pretty rough to start with. In the second wormhole pocket, I found another wormhole-but it led to null-sec space. Well, this was what I wanted, wasn’t it? So I went into the wormhole, and appeared about fifty-some jumps away from my home space. And it was empty. Null-sec isn’t like wormhole space-you can see who’s in the area with you on the Local chat tab. I was it. I’d appeared in a dead-end system, one stargate in and out. I still took precautions of creating a safe-spot and then cloaked up and scanned for stuff. I found a data site, so I warped on over and hacked upon some of the containers there. It wasn’t exactly huge profits, but it did introduce me to some twists to the hacking game that I hadn’t seen in hi-sec, like one of the nodes that strengthened other defensive nodes. That made life rough until I caught onto what was going on. I didn’t do badly, though. I thought about returning home via the wormhole…but what’s the fun in that? The whole point was to see what I could see, right? So I warped out. This system was NOT uninhabited. There were about eight other ships there, and they knew I was there as much as I knew they were there. Not a word showed up on local, but my assumption was that they were all allied with each other-and they would be looking for me! So I again went out of my way to find a safe spot-constantly moving and warping-and then cloaked up and scanned. Unfortunately-or fortunately!-there really wasn’t much to speak of in the area. Not even another wormhole. So the next trick was to get out before they caught up with me. That was where I made my first mistake. I warped to a gate about 50km out, figuring to see if they’d set up any warp disruption bubbles or something similar to stop me from warping directly to the gate. Of course, this would mean I would be exposed. I can’t warp while cloaked in this set-up. I saw there was no bubble, so I began flying toward it, afterburners blazing. This was a mistake. I was still about 30km out when I saw the first ship warp into the area. Maybe I was scanned out, or maybe they were sending guards to all the gates, but I was spotted now. Second mistake made at this point-and it was related to the first. And that mistake was this: I should have warped away back to a safespot-or really, ANYWHERE other than trying to get to the gate. By the time I realized this mistake, reinforcements showed up and I was being scrambled-there would be no escape for me. Boom. Bye bye, Imicus starship. But, amazingly, not bye bye pod! I’d already managed to target another stargate so that the moment my pod ejected, I was warping it away-so I escaped death! (Of course, I lost the stuff I’d hacked out, but it wasn’t exactly earth-shattering profits.) So it was time to make my way back to home space-or perhaps near it. I decided that this was as good a time as any to have a jump clone situated in Jita, the biggest marketplace system in EVE. This did mean, though, that I’d need to get through a very lengthy stretch of null and low-sec space. It actually wasn’t as hard as it sounded. Once I’d evaded the guys who blew up my ship-they didn’t really pursue, since they had no idea where I’d gone by then-a large portion of null-sec was empty. At least until I neared low-sec. On one of my attempts to get out, I hit a warp disruption bubble-and there were active ships not far. I’d reacted quickly enough, though, to get my pod out of the bubble and warping to one of the other objects in the system. Checking my map, I worked out where to go to warp directly to the gate without intersecting the bubble-it’s HARD to cover all the access points to a gate-and warped directly to the gate from there. I think I caught someone going “What the hell? !” as I blew through and warped out. There may have been some pursuit briefly, but I was well positioned on the other side, and I continued my journey. Ultimately, I did make it out, and I did make it to Jita. It was a heck of a trip, and it’s something I’ll likely try again soon for the kicks. I’d have liked to get deeper into wormhole space, but if I end up somewhere else…well, that’s the whole point of exploring, isn’t it? The last time I wrote on EVE, I’d mentioned the joys of grinding standings. I’d been slowly but surely developing my Sisters of EVE standing by running a lot of courier missions. And by a lot, I mean “Oh-My-God-This-Is-Killing-My-Soul”. Combat missions might’ve made the process go faster, but my experience in the last level 4 combat mission I’d done made me somewhat wary. Still, it was getting done, and I was creeping up closer to my target standing; I wanted to get to a standing of 8.0 or above, and I was sitting a little over 7.5. That was when a new storyline mission popped. Things have changed a wee bit since that ugly encounter. The time had been well spent in continuing to skill up combat skills; I could upgrade a fair chunk of my Megathron battleship to tech-2 equipment. Not the guns, naturally-that would’ve been too easy. But the armor hardeners that upped my resistance to various types of attack, the armor plates, and my capacitor rechargers that-in theory-would mean I could fight longer…all that I was now able to use. I was also able to use a tech 2 armor repairer, but the problem with that was powergrid issues; couldn’t get it fit. The differences were marginal enough-at least at first glance-to make me feel that I could live without that. I believed that a successful level 4 storyline combat mission could get me a lot closer to that magic 8.0. And this time, I did my due diligence. I hopped on the web and reserached the mission, and found out that it would feature drone attackers-not the drones like players use, but frigates, cruisers, and battleships controlled by AI. This meant that EM weaponry would probably be best. Of course, last time around, I’d mentioned that hybrid turrets didn’t exactly give you flexibility when choosing damage; it was thermal and kinetic damage and nothing else. I still hadn’t trained up other weapons of large size (pretty much required for battleships), and I’m not sure I’d have switched even if I had; the Megathron has enough bonuses to large hybrid turrets that I’m not sure I wanted to go without. My own drones were a different story. I loaded up five EM damage-dealing medium drones, and three light drones of the same, rounding it off with two light thermal damage drones. I’d basically used tech-1 versions that I’d looted from other combat missions. My strategy was going to be fairly simple: drones to deal with frigates and cruisers, and the guns for battleships. This time, I’d loaded up with iridium ammo for range, and antimatter for damage. My guns were still the long-range railguns; in hindsight, I probably should’ve considered blasters, which are shorter range but lots more damage. This is what happens when you ignore the numbers. Now that I was armed for bear-in theory-and making sure I had enough time for the night’s festivities, I flew into the encounter. Right off the bat, I knew I might have issues; unlike some missions, which could allow you to warp in much further away (which would’ve been nice for a rails-equipped ship), this was “warp to encounter’; there would be little breathing room. My ship warped in, and the attack began. Things got ugly fast; my light drones made fast work of the frigates, and my medium ones had taken out one of the cruisers; but I was taking damage a lot faster than I’d figured. Looking at one of my armor hardeners-a reactive hardener-I could see that it was putting its efforts into dealing with explosive and EM damage. Naturally, my ship was using armor hardeners that dealt with thermal and kinetic. Oops. I recalled my drones, and warped out-but not before the attackers began chewing into my structure. I repaired the armor damage with my armor repairer, warped to a station, docked to recharge shields and capacitor-and to fit the EM and explosive hardeners. Why take more abuse if you don’t have to? Then I returned to the field of battle. And my reactive armor hardener began applying mostly to thermal and kinetic. Well, the intel had told me to expect “all damage types”. I just didn’t expect to have them adjust on the fly like that. Well, what’s good for the goose…. 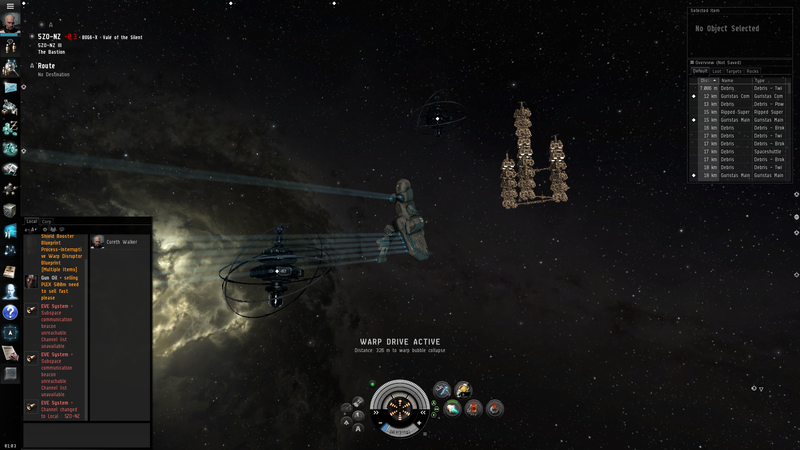 I cleared out all of the cruisers before warping out again-and this time, more of my structure was getting hammered. Structure is expensive to repair; I could see my profit margins going down fast in this fight-especially since drones tend to drop pretty much nothing as far as loot goes, and I could tell I wasn’t going to have the time to do a salvage job later. At this point, I began to consider new tactics. When I warped back in, the first thing I did was hit the afterburners. I’d installed them on the ship for situations like this-when I’d need to put distance between my attackers and me. Distance was my friend; I could hit targets fairly reliably from 70km away, and still hit fairly hard. The damage of my attackers became less reliable, and the accuracy hurt too. In short, the enemy was apparently set up for close range fighting-and I wasn’t. It was time to fight on my terms, not theirs. To cut short a long story…it took a fair chunk of time, but in the end, there were a lot of broken drone ships, and my ship had come out on top. The only downside-well, in addition to structure damage-was the fact that I was so relieved it was over that I warped out-and forgot to pick up my medium drones. Oops. Well, it’s not like I can’t find more. Heck, I’ve swiped unattended drones by scanning them down on occasion. Drones aren’t an issue, especially since they were all tech-1 drones. The standing jump put me well above 8.0. So now things open up a bit. I immediately created a jump clone at the SOE station, flew my battleship back to its home dock, then jumped into that clone. Then I installed another jump clone. (If I remember right, I should be able to install another later for a total of four clones-my “original” and 3 jump clones.) So that puts me pretty much where I want to be for my big goals. A truism of EVE is that you should never fly anything you aren’t prepared to lose. EVE is still very much a PvP game, and if a player thinks he can gain by blowing you up in hi-sec, even the punishing CONCORD retaliation won’t save your ship. In lower security regions, players don’t even have to worry about that-they’ll blow you up just because you might do the same to them. Or for the laughs-it’s hard to tell sometimes. Add to that null security space, and the major player alliances and all of that…and you can see where the problems can come into play. Add to that the fact that my clone-until now-had a heap of implants improving attributes, which allow me to train some skills a tad faster. That mades getting my pod killed dangerous-in other wordes, I wasn’t prepared to lose the implants, so even my pod was something I couldn’t afford to lose, in my mind. That situation no longer exists. With the jump clones, I now have two clones which have no implants; it slows training time, but it frees me up to do fairly suicidal things. Which is, amusingly, the next step. 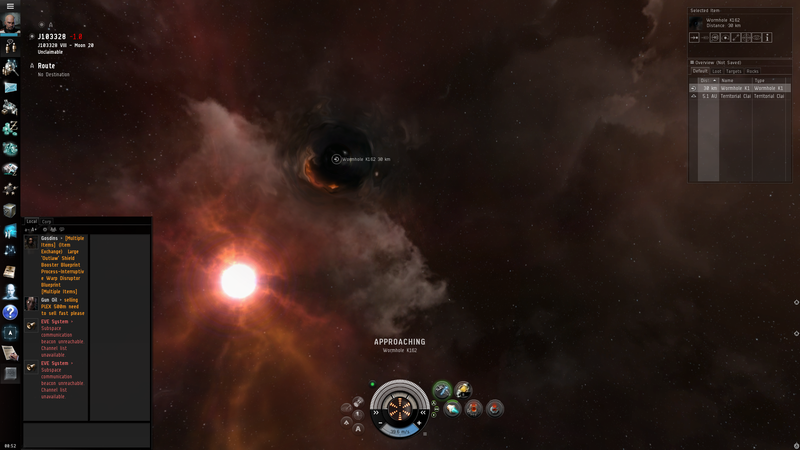 Way back, CCP introduced wormholes to their game, where you could go into strange space where there was no protection, but also no set gates to guard. The only ways in and out of wormhole space were-duh!-wormholes. And those regions of space always had wormholes, often to other regions of space-even other, deeper levels of wormhole space. They could wind up putting you anywhere. This has appealed to me a great deal, but aside from short visits, I’ve been reluctant to explore them fully. Mainly because if you got your ship killed, you had an excellent chance of being stranded in wormhole space so you’d have to pod-kill yourself to get out. And I already mentioned the implant issue. Not an issue anymore. So in the not too distant future, my plans are fairly simple: get a fairly cheap frigate with cloaking device and cheap scan probes, find a wormhole (which isn’t too hard, especially since I’d sharpened my scanning skills a long time ago), and see how far down the rabbit hole I can go. It won’t get me any money-the “rats” in wormhole space are way too dangerous for the ship build here-and it won’t get me anything special, but that’s not the point. The point is to get out of my nice, comfortable hi-sec nest and go somewhere new. It may be boring as hell; it may be the wrong kind of exciting (“Ooo, look at the tech-3 cruiser shooting at me! Oops! I’ve been podded!”). It might strand me deep into low-sec or null-sec space. But it’ll be fun-and since I’m not tricking out the ship (not like I’m taking a tech-2 ship or something like that), it’ll be easily replaceable. And when I get back to my home space, whenever that is, I’ll have a tale to tell. At least, that’s the hope. Time for a thrilling story of actions and consequences in EVE Online! I’d mentioned previously that one of my longer term goals was to pick up a Sisters of EVE Stratios cruiser; it’s an exploration type of cruiser, and as that’s the sort of thing I want to mess around with more, I’d had that on my list of long term plans. While originally I ran a bunch of Sisters of EVE missions to get enough Loyalty Points to purchase one, I came to the conclusion that I was far more likely to have earned the cash to buy one off the market outright before I got enough LPs. So you’d think that would be a reason to stop running the SOE missions, right? Well, not quite. See, I realized that in the process of doing this, I was gaining in standings with them, and having a high standing with them would eventually allow me to create a Jump Clone; for the uninitiated, this would be a clone of my character that I could “jump” my consciousness to, no matter where it happened to be at a given time. There’s a cooldown-a day, maybe less if you train up a skill, but it’s close enough to a day that I’ll stick with that. But this could allow a guy to, for example, have a clone in the trade system of Jita, and jump to a new one all the way to null-sec space. It also allows you to be a bit more free with risky behavior, because your “main” clone probably has all those implants giving all kinds of bonuses you’d hate to lose if, say, you wandered into low-sec space and got blown up. Jump clones are clean, so they don’t have any implants to lose (well, unless you put them in). You can have more than one of these, too, based on training up a skill to allow it. Still only one transfer a day, though. Okay, so that’s the backstory. -but I was still in the process of getting the character set with the support skills to make it work. Now, every sixteen missions or thereabouts, an agent offers a “storyline mission”; this is a big deal, because that gives factional approval instead of corporation approval. The SOE is a corporation in the Servant Sisters of Eve. If I gain faction with the SSOE, I gain a jump for the SOE. Blowing this mission, though, can give a hit to the factional standings, and thus to the corporate standings. Now, I’d been doing distribution missions, which tended to be “haul this somewhere”. But this storyline mission was a level 4 combat mission. Well, this was what I’d been preparing for; with visions of moving closer to the magic standing number to make jump clones, I delayed the mission, hoping to buy more time-I still couldn’t load up the large turrets on the Mega yet. Then I bought more time by accepting the mission some days later; my training time would get me to where I needed to be by the end date, and I didn’t care about the bonus reward anyway. Heading on a date…with DESTINY!! The day came, and I set out in my Megathron to destiny! Destiny, however, isn’t necessarily a good thing. The good news: my ship didn’t die. The mission killed some of my strategies immediately; my intent was to blow up battleships at long range, while cruisers and frigates that got close would be taken out by my drones. But the mission included a constant pulse of damage that more or less demolished drones, which meant I was in serious trouble. I had to rely on distance and my guns to deal with the small fry, which was no easy task. Then came the battleships. Mistake One: flying a Gallente ship, and going off of Gallente bonuses for that ship, I tended to use hybrid turrets. Hybrid turrets deal thermal and kinetic damage (the amount varying on ammo type). The targets didn’t have a particular weakness for that damage type. So I wasn’t exactly applying strength to weakness. My armor, on the other hand, was set to deal with what they could dish out-so as long as my capacitor didn’t drain dry, survival wouldn’t really be an issue-as long as I bugged out when it did. Hit and run tactics are certainly viable, especially if you need to work with range. Maybe I should’ve loaded up energy turrets instead-but I’m not sure how much of a hit I’d have taken using those (plus, y’know, I’d have to train up large energy turrets…). Mistake Two: ammo type matters, too. I was using Iridium charges, which had the benefit of having range bonuses, at the cost of lower damage. The fun part: the range exceeded my targeting range. I probably could have put in ammo that had a range penalty and been able to still hit the targets, and get more damage out of it too. That’s what inexperience will do for you. Still, I did manage after a long bout of hit and run, to wipe out the defenders of my target! At last, I rubbed my hands together, aimed the guns, and opened fire. Then another wave of battleships appeared to defend it. I looked at the numbers. Looked at my clock, and figured how much time I had left that evening. Looked at how much damage I’d inflicted on my target-not much at all-and shrugged. It had been a nice try-maybe I just wasn’t prepared yet. Maybe another week or two of training would’ve done good-or longer to get some of the tech 2 gear fit. Reluctantly but firmly, I quit the mission. And my standings went right through the floor. My SSOE standings went from “Good” to “Bad” in no time. My SOE standings took such a hard hit that I had gone from being able to approach level 4 mission agents to barely being able to do level 2 mission agents. The only bright spot to it all was that the agent I’d been using-the one whose missions had opened up that storyline mission-was still hanging on at giving me level 4 missions. But the standing hit was so bad that I couldn’t see how I could stand putting all the effort into getting back to where I was in standings, much less pushing to get jump clones. Note to self: never accept a storyline mission you don’t think you can finish. Ever. Harsh lesson, but EVE is a harsh place. I slunk back to my normal area of space and started running missions for the Gallente Federation Navy, since mission agents are plentiful and it would give me more time to learn how to use the Mega-and more time to train up skills to do better stuff with it. And of course, combat missions DO tend to pay better, which isn’t exactly something to ignore. There is a happy ending to this, of sorts, though. Recently I headed back to the SOE agent (mainly because I’d left my hauler in that station), and ran a couple of courier missions just to kill time. To my shock, after the second one I got offered another storyline mission! I realized that I must have spent so much time running regular missions between when I was offered the last one and when I actually did it that these two runs had opened up a new storyline mission. And better yet, it was a courier mission! So I had my hauler make a couple of trips with a whole lot of cargo and finished that mission, and the standings gain very nearly put me back to where I was before the disaster-and suddenly, SOE looks like a decent prospect at pushing to jump clone standings after all. So now I run the distro missions for SOE until I get a mission that sends me to places I really don’t plan to go in a tech 1 Industrial; then I head back and do the Fed Navy stuff for fun and profit. It’ll be amusing to see which one gets me to the standings needed to start cranking out jump clones first. EVE Online is a setting where choices have consequences; but sometimes, even if you make a wrong choice, you can still turn it around-even if it’s just by accident.